In the 1936 Olympic games in Berlin, a single man captured the attention of the world, winning 4 gold medals, an Olympic first. Sixty years later, thousands gathered to honor this man with the dedication of a park named in his honor, the Jesse Owens Memorial Park. 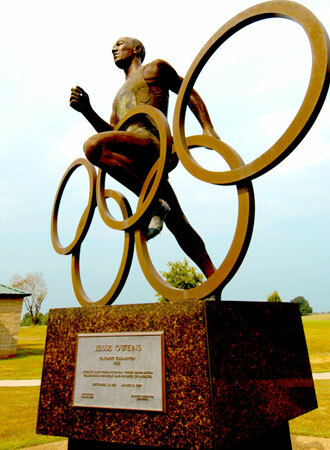 Dedicated on June 29, 1996 with the arrival of the Olympic torch on its journey to the Atlanta games, the Jesse Owens Memorial Park is a tribute to the Olympic track and field superstar. 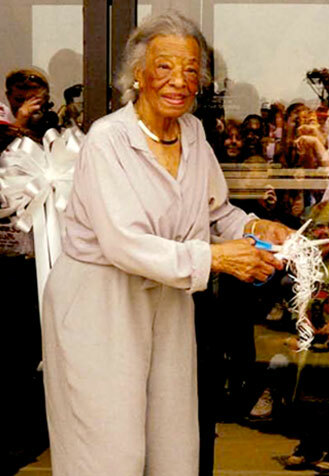 Ruth Owens, Jesse Owens’ wife, cutting the ribbon to officially open the museum to the public. The park and museum are located in Oakville, Alabama, Jesse Owens’ birthplace. The park located in Oakville, Alabama showcases several memorials for Owens including a museum, statue, 1936 torch replica, birth home replica and an oak tree of the same variety as Owens’ gold medal tree. Our goal is to honor the life and accomplishments of this remarkable man and to mirror Owens’ dedication to America’s youth by investing in the community. The park provides facilities for community use such as a basketball court, baseball/softball fields, playground and picnic tables and pavilions. Park Directors and Board members are hopeful that one day funding will become available to complete the final phase of park development, the construction of an Olympic size track. This addition would make it possible to sponsor annual youth competition modeled after the ARCO/Jesse Owens games held in Phoenix, Arizona until 1994. The museum, located in the park, immortalizes Owens’ memory by depicting the moments that made Owens great and portraying the people who shaped him as an athlete and as a man. Glass display cases showcase rare memorabilia including programs from the 1936 Olympics, replicas of track uniforms and shoes and medals and trophies from Owens’ high school days. In addition, interactive kiosks highlight Owens’ life, unparalleled athletic accomplishments and his humanitarian contributions to the larger world community. Capturing Jesse Owens’ race to four gold medals, the museum houses a mini-theater showing Bud Greenspan’s 1966 film Return to Berlin. In it, Greenspan takes Jesse back to Berlin and the Olympic stadium, to narrate his experiences in the games. This forty-minute movie will captivate visitors of all ages. The eight-foot, one-ton bronze statue of Jesse Owens located in the Gold Medallion Court, outside the museum. Designed by sculptor Branko Medenica, a Birmingham resident. 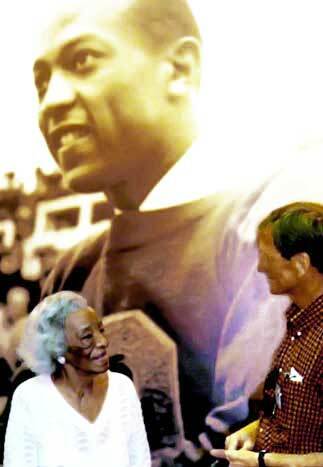 Ruth Owens & James Pinion at museum dedication with a larger-than-life panel display of Jesse in background. The Owens family was in attendance for the dedication. For those interested in learning more about the life of Jesse Owens, the museum offers The Decatur Daily Resource Center. Equipped with computers, printers, internet access and a library of over 75 magazine and newspaper articles, visitors have the opportunity to do independent research into the life of Jesse Owens. A gift shop is located inside the museum and offers a variety of souvenirs and educational materials. Visitors can purchase an assortment of books and DVD’s about Jesse Owens’ life and his accomplishments. Also available are Jesse Owens Museum logo clothing, whistles, lanyards, pencils, bookmarks, caps, key chains and more.